Sewing is a wonderful hobby to pick up, as it is both relaxing and productive. You can still enjoy listening to your favourite music and watching your favourite TV shows in your down time while simultaneously getting something done. Breaking into the world of sewing can seem intimidating, but with this simple guide you’ll be creating your very own line of clothes in no time! The most important thing to remember with any new skill is things are not going to happen perfectly every time. You are going to make mistakes and it is only by having patience and taking the time to correct with them that you will end up with the product you desire. If a seam turns out crooked, don’t press on and hope everything will work out in the end. Take the time to pull out the stitches and try again. It is only by being patient with yourself and your new skills that you will get things how you want them. Never forget that everyone who sews was new to it at one point. Fabric stores are filled with knowledgeable people, many of whom are very willing to help you pick out the appropriate length of fabric or necessary thread. And when you get unexpectedly stuck on something, the internet is also a great resource. There are many blogs and video tutorials out there today with just the answers you’re looking for. We are all constantly learning and developing as people. 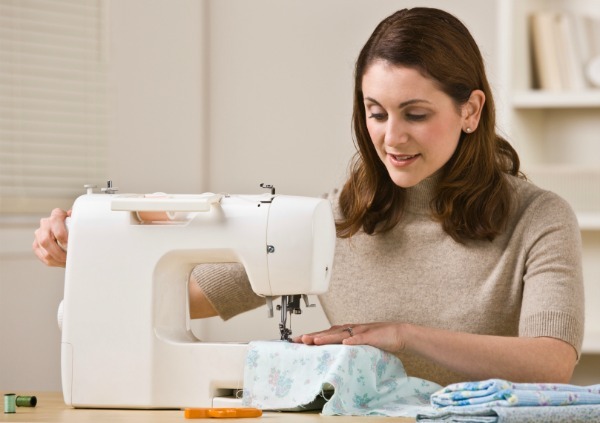 A creative skill such as sewing is no different. You wouldn’t hesitate to sign up to work with a teacher if you were taking up Mandarin, and sewing is just the same. There are many classes out there for every skill level, so look into what your city has to offer. Even the most skilled seamstress learns how to deal with new challenges with each garment she produces. And when you first start out, you are going to be dealing with a fountain of information. So, it isn’t wise to start off with trying to create that strapless Badgley Mischka dress you’ve been eyeing right off the bat. Instead, begin with something simple, such as a clutch or loose-fitting shirt. McCall’s has a whole line of simple and inexpensive patterns to get you started. As you develop your skills you will find shortcuts and tricks that you find work better than what might be suggested. But until you get to that point it is safest to stick to the rules. Patterns are designed by experts and they do their best to make the instructions as easy and understandable as possible. To ensure that you get the best possible results, follow the instructions closely before you get your confidence up and are ready to branch out. And most importantly, have fun and stick with it. Sure, there will be times where you get stuck on a particular step and you just want to give up entirely. But if you keep trucking you will have a new and highly useful skill that will last a lifetime!